What is meant by money market and capital market? The term, financial markets, is a loosely coined term to depict the broader market where exchange of financial securities take place. It brings both borrowers and lenders to transact. The financial markets are merely a vehicle that bridges the gap between supply and demand. This enables a healthy circulation of excess funds from one entity to another. The financial markets, in enabling the transactions helps in the development of an economy. A healthy financial market environment is crucial to the health of the economy. Lenders who have excess capital make use of the financial markets in order to lend money and earn additional income. Borrowers on the other hand, use the financial markets in order to borrow money to meet their capital requirements and to allow them to undertake corporate actions. The financial markets are mainly divided into the money markets and the capital markets. Pick up any type of a financial instrument and chances are that it can be categorized into one of the two main categories of the financial markets. The financial instruments fall into one of the two categories depending on the borrowing and the repayment requirements. In this article, we explain the capital markets and money markets. You will learn about the differences between these two types of markets and how they are used to suit specific purposes. The money markets are an unorganized aspect of the financial markets which includes banking and financial institutions besides other entities such as dealers and brokers. Trading in the money markets are short term and another word used for the money markets is the wholesale markets. Some of the most common financial instruments traded in the money markets include credit trade, commercial paper, certificate of deposits and treasury bills to name a few. What is common to such type of financial instruments is that they are short term in nature. The redemption period is limited to no longer than one year. Due to the short duration of these instruments, the returns are not as high compared to other markets. Because of the low rate of return, the money market financial instruments are considered to be relatively safe when compared to their other counterparts. An important aspect to know about the money markets is that it is an unsystematic market. In other words, trading is mostly done over the counter as the two counterparties agree to the terms. The trade's economic details are mostly confirmed over the phone or by fax. The money markets play a crucial role in the circulation of the short-term funds in the economy. This enables the participating institutions to meet their working capital requirements. Money markets are used by a wide range of market participants. It could include companies that want to raise money by selling commercial paper to investors who want to use the certificate of deposits as an instrument to park their money in the short term. Typically, the money markets are considered to be safer than the other types. This is due to the short-term nature of these instruments as discussed in the previous sector. There isn't much that an investor can earn by investing in the money markets. This is because the money markets are very conservative. As a result, the return one gets is also lower compared to other more widely known securities. This is also one of the reasons why the capital market financial instruments are more popular compared to the money market instruments. Certificate of deposits - As the name suggests, a certificate of deposit or CD for short is a certificate that is issued by a bank to an investor who deposits money for a specific period of time and at a specific interest rate. The certificate of deposit of course is just a term and now a days, you don't actually receive a certificate but rather a digital acknowledgement of the same. Certificate of deposits goes by other names such as fixed deposit in some countries. Commercial paper - Commercial paper is a short-term promissory note that is issued by companies. The commercial paper is also known as an unsecured short-term debt instrument issued by corporations. The commercial paper is typically used for financing of short-term operations such as inventories, payroll processing and accounts payable. Typically, commercial paper maturities are no longer than 270 days or three quarters of a year. Fed funds – The Federal funds are known as short term lending between banks. Of course, the federal funds are not directly available to the average investor. The federal funds or fed funds for short are usually by banks to cover their short-term liabilities or to maintain the bank reserves. Repos – The repos are short for repurchase agreements. A repo is a short-term agreement for dealers in government securities. With a repo agreement, the dealer surrenders their securities to investors usually on a short-term basis such as overnight and buys back the securities the next day. For the counterparty that is agreeing to the repo agreement, it is called a reverse repurchase agreement or a reverse repo. In most cases the collateral used are U.S. Treasury bonds. Treasury bills – These are short term bonds issued by a government. They typically do not yield any interest, but they are issued at a discount when it is redeemed. These are debt obligations and are backed the full trust and faith of the U.S. Treasury department. Known as T-Bills for short, these have a maturity of less than a year and are sold in denominations of $1000. Capital markets are another segment of the financial markets where in major financial instruments such as government and corporate securities are traded. The purpose of the capital markets, as the name defines is to raise the long-term financing needs for the institutions to meet their capital requirements. Some of the most popular securities traded in the capital markets include stocks, bonds, debentures, to name a few. What is common to these types of financial markets is that they have a long-term maturity beyond a year. On some securities, there is no maturity, for example stocks. The capital markets play a major role in the circulation of capital in the economy. It plugs the need between lenders and borrowers also known as suppliers and the users. The capital markets are closely regulated. In the United States, the capital markets fall under the supervision of the Securities and Exchange Commission (SEC) and abroad, there are similar financial regulators for the capital markets. The capital market combines the dealers and the auction markets. A sub-classification of the capital markets can be categorized into the primary and the secondary markets. Primary markets - These are the markets are securities are issued for the first time. Investors need to subscribe to these securities. Common examples include a government issuing a new 5-year or a 10-year bond, or a company going public by means of an initial public offering or an IPO. Secondary markets - The secondary markets are where the initially issued securities are traded. These are traded primarily among investors and considered to be more liquid than the primary markets. It is usually the subscribers of the primary markets who become a major part of the secondary market to buy and sell the securities they obtained through the primary market. As the name suggests, the capital market instruments are primarily used to raise capital. The type of capital raised can be either equity or debt. Therefore, when one talks about capital markets, it could be either stocks or bonds. The capital market instruments usually have a longer-term maturity. As a result, they are riskier, but at the same time, such instruments can also give good returns. Institutions use the capital markets for longer term financial obligations. There are inherent risks because of this. For one, the longer the horizon that you lend your money, the greater the uncertainty about the institution going bust. Still, capital markets are very popular due to the high reward or returns that they give. The capital markets are also much more liquid compared to the money markets. Let’s take a look at some of the most popular capital market financial instruments. Stocks – As the name suggests, stocks are issued by corporations in order to meet their long-term financing needs. The financing needs can vary, from acquisitions to expanding their horizons. Typically, the operations are long term and as a result, stocks allow the investor to own a share in the company. Stocks can be primarily categorized into the equity markets and are usually preferred stocks, known as Class A shares or general stock, known as Class B shares. Bonds – Bonds are used when an institution or a corporation wants to raise money as a debt or liability. The bonds issued are always longer than one year. The general standard tenure or duration of a bond is five years. You can of course have longer date bonds. Bonds can be issued by governments and corporations alike. The yield you can get on a bond can vary based on several factors ranging from the financial health of the institution or the company to inflation and so on. Derivatives – The derivative financial instruments are basically derived from the stock or bond markets. The derivative instruments as the name suggests derives their value from the underlying instruments which are either equity or debt. Within the derivative markets, there are many more financial instruments that one could use. For example, options are mostly used for stocks, while for bonds, you have credit derivative instruments such as credit default swaps. The derivatives are mostly used to hedge the exposure from the underlying markets. 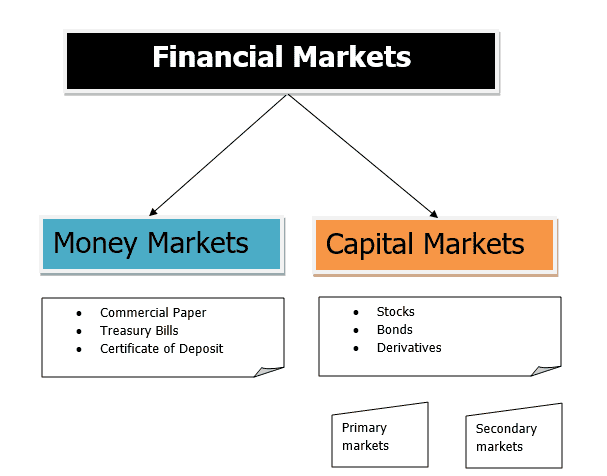 Now that we have an understanding of the capital and money markets and also looked at the different types of financial instruments, let’s summarize the key differences between money markets and capital markets. These instruments are more conservative and have a shorter life span. As a result, the returns are less and the risk is also less. Not easily accessible to the general public with the exception of commercial paper and certificate of deposits. Easily accessible especially in the secondary market. Due to the high amount of liquidity, transactions are larger and higher in volume. Conclusion – Capital markets or money markets? By now you might be wondering which of these two types of markets are more important. Some might even wonder which of these two markets are better for investing. The answer is that both the capital and money markets are important. This is because each of these two types of markets suit a significant aspect of the financial markets. The health of both these two markets are essential for an economy to perform well. During a healthy economy, there is more credit that goes around. This allows institutions to choose between money markets or capital markets. The money markets are mostly tailored to meet the short term borrowing of the financial institutions involved. Therefore, the scope of such markets are limited. At the same time, they are safer but conservative. Conversely, the capital markets which are more popular, are highly liquid and is essential to the long term performance of the economy. For investors, you can choose the financial instruments between these two types to meet your investing goals.